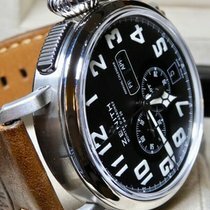 Zenith Pilot Type 20 03.1930.681/21.C723. Automatic Zenith caliber Elite 681 movement. Steel 40mm case which is water resistant to a depth of 100 Meters. Black dial with white Arabic numerals and 60-second sub dial at the 9 o' clock position. 27 jewels, 28,800 vph and 50-hour power reserve. Brown leather strap with cream stitching on a steel Zenith star buckle clasp. Box and papers dated September 2014.